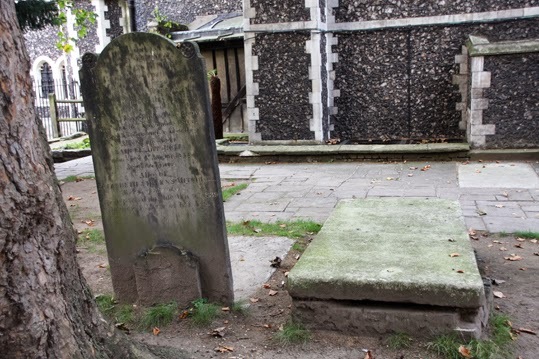 Continuing my month of celebrating death on A Bad Witch's Blog in the weeks around Halloween, here is a grave that Hugh Grant posed on in the movie Four Weddings and a Funeral. It is in the churchyard of St Bartholomew-the-Great, in London, and the church was also the scene of the fourth wedding in the film. This custom was called the “Widow’s Sixpence”. Apparently hot cross buns are still given out to choirboys on Good Fridays, but not sixpences. The churchyard was one of the sites I visited recently when I went on a Secret London walk and I am indebted to tour guide Richard Jones for telling me about the grave's famous history. 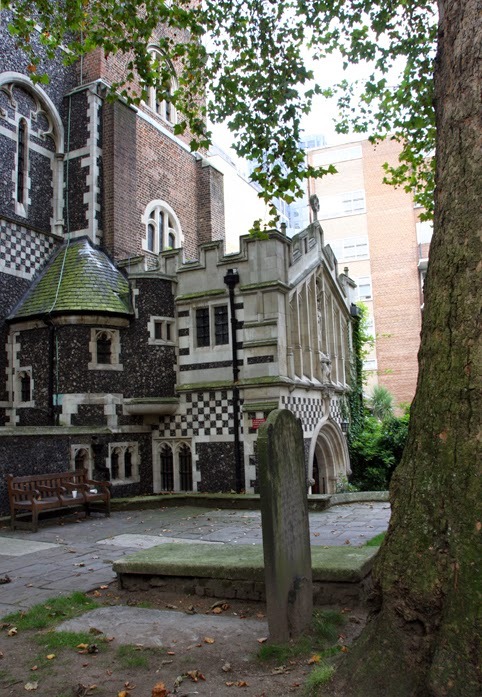 St Bartholomew-the-Great is one of London's oldest churches. 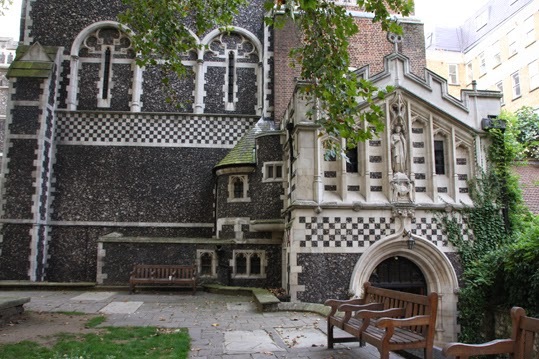 It was founded in 1123 as an Augustinian Priory and has been in continuous use since 1143, escaping destruction in the Great Fire of London in 1666. These days, if you want to go inside and have a look then you have to pay an entry fee to go towards the upkeep of the the church, although you don't have to pay if you are just going to pray there or attend a service. If you are ghost spotting at the church, it is said to be haunted by a monk who is looking for a stolen sandal. Some people have also smelled a strong scent of burning late at night, which is said to be a spectral reminder that heretics were burnt to death in the area around the church during the reign of Mary Tudor.